Vehicles: civil, racing, stock, custom. accessories; Trains: custom, engines, accessories. Hapico, Motoi Shiozawa, 973 Dahlia Ave., Costa Mesa, California 92626-1750,U.S.A. HARD HERO, Hard Hero Enterprises, P.O. Box 10724, Murfreesboro, Tennessee 37129, U.S.A.
Island Collectibles, Inc., 329 Maryland Ave, Massapequa Park, New York 11762, U.S.A.
Aviation: military, historic, decals; Vehciles: AFV accessories, decals. Vehicles: auto racing, civil,stock, custom. Jaguar Models, Jaguar Models, Inc., 17421-B East Gale Ave., City of Industry, California 91748, U.S.A. Figures: military, historic,science-fiction, fantasy, accessories. Japanese Armor King, Ted Dyer Inc., P.O. Box 1030, Roslyn, Pennsylvania 19001-9030, U.S.A.
Vehicles: tanks, armored, military, historic; Figures: military, historic, accessories. Joe Laudati, Joe Laudati, 5 Southside Ave. #8C, New Paltz, NY 12561, U.S.A. Figures: science fiction, fantasy, historic, prehistoric. JRutman Products, Jerry Rutman, 2240 Barrington Road, Bethlehem, Pennsylvania 18018, U.S.A.
KFS KIT FORM SERVICES, 7 Horbling Lane, Stickney, Boston, Lincs, PE22-8DG, England, U.K.
Vehicles: trucks, civil, military, accessories, decals. Kitchen Table Resins, Ken Kitchen, 9660 Pinebrook Way, Colorado Springs, Colorado 80920, U.S.A.
KRENTZ PRESNTZ, DAVID KRENTZ PRESENTZ, U.S.A.
Avitaion: military, historic, accessories.Also offers commercial services. Figures: historic, military, accessories; Weapons: field, light, historic, accessories. MasterCasters, 28 Bridge Road, Oulton Broad, Suffolk, NR32 3LP, U.K.
MATADOR MODELS, 6 Cliffe Road, Barton-on-Sea,NEW MILTON,Hants, BH25 7PB,U.K. Vehicles: military, armored, accessories; Aviation:accessories. Vehicles: auto racing, stock, custom. M&G Mouldings, 7 Carnation Drive, Saffron Walden, Essex, CB10 2BE, England, U.K.
Vehicles: civil trucks,parts, accessories, decals. missinglink, Kevin Lutz and Bob Daykin, U.S.A.
Vehicles: auto racing, formula, stock,custom. MODELSHACK, Model Nerd's ModelShack, U.S.A.
As many of you may know, resin manufacturer's are often the only source to find those rare, hard-to-find, one-of-a-kind kits. This is the reason why so many kits are short-run and often not repeated after a certain number or specified time period. Below is a kit by ML LABS, INC. of Milwaukee, Wisconsin, U.S.A., from years ago. This little company made only six kits, three dinosaurs, Mt. Rushmore, "Old Smokey" and this one. 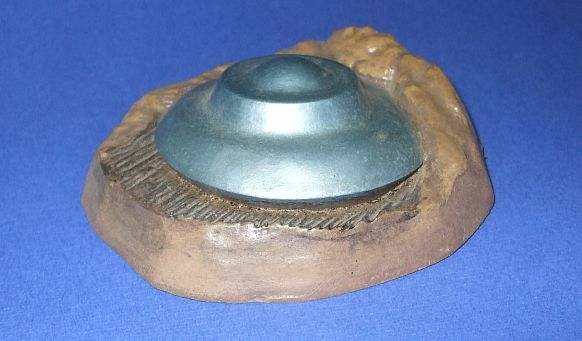 Apparently this is the Roswell flying disk or other U.F.O. which crash-landed on planet Earth. The kit was cast as a one-piece resin in HO/OO or 1/72 scale. All that was required was cleaning off the release agent and painting. No sanding, filing, filling or even glue. For about US $5.00 "back-in-the-day" this is a very unusual and interesting subject! We can contact virtually all the major resin manufacturers, dealers, even individual collectors to help in your quest. Search fees will be reasonable with discounts for members. We can even arrange shipping, at cost, from this site. Here is a resin kit of the Diamond T "Doodlebug" fuel tanker from the 1930s. Designed by Howard W. Kizer, the unusual body was an attempt at streamlining. The engine was located at the back of the vehicle and the gear-shift, clutch and steering mechanism were all air-powered. At 26 feet long, fuel load was about 1,500 gallons. A very advanced approach for the 1930s. This kit is cast by Jeffrey Blatz in HO/OO scale. The body is solid with separate wheels. Detail is excellent and assembly is very hobby friendly with five pieces to fit. You can find these kits on eBay under "herrblatz."